Summary and Definition: The Yuchi tribe originally lived in the eastern Tennessee River valley but moved across the southeast to escape devastating epidemics and inter-tribal warfare. The tribe became allied to the Creek Nation in the early 1700's and fought against the United States in 1813. The Yuchi tribe was removed to Oklahoma in the 1830's with the Creek people and became absorbed into the Creek and Seminole tribes. The above picture depicts Eteh-ée-fix-e-co, meaning Deer without a Heart, who was a Yuchi chief. It was painted by the famous artist George Catlin (1796-1872) at Fort Moultrie in 1838. George Catlin had traveled to Fort Moultrie on Sullivans Island, outside Charleston, South Carolina to make paintings of Seminole and Yuchi Native Indians who were being held as prisoners following the Seminole Wars. They had been forcibly deported from Florida. The proud chief wore a striking vermillion red matchcoat, basically a blanket that was wrapped around the body, and this instance was hung over his shoulder. He also wore a shirt, leggings and moccasins. His headdress consisted of a strip of cloth wrapped around his head adorned with and eagle feather. Members of the Yuchi tribe were known to live in widely scattered villages that ranged from Illinois to Florida, and from the Mississippi River to the Carolina coast. The Yuchi tribe spoke their own language (Euchee) and it is not known to be related to any other language. The name Yuchi is believed to derive from their word "Yudjiha" meaning a 'people of significance'. The Yuchi tribe, ravaged by disease and warfare, eventually joined with the Creek nation and included in the people known as the Five Civilised Tribes. The Creek tribe, with members of the Yuchi were forced to relocate to Oklahoma in the 1830's. Where did the Yuchi tribe live? The Yuchi are people of the Southeast Native American cultural group. The geography of the region in which they lived dictated the lifestyle and culture of the Yuchi tribe. Who was a famous Yuchi chief? One of the most famous leaders of the Yuchi was Timpoochee Barnard (c.1776 - c.1834). 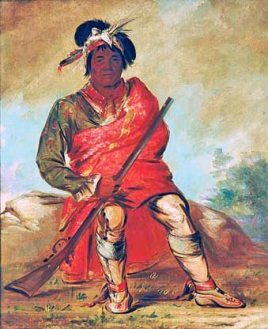 Timpoochee Barnard was a Yuchi military leader who led his warriors to fight for the United States during the Creek Civil War and the First Seminole War in the early 1800's. 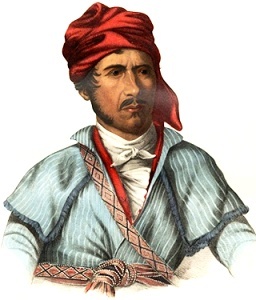 The picture of Timpoochee Barnard shows him wearing a turban style headdress that was worn by many of the southeastern tribes. The turban was made with strips of cloth, such as calico, wool, or even silk, wrapped around their head like a turban. The turban style headdress was often decorated with a feather plume which was considered to be of spiritual significance holding great power. What clothes did the early Yuchi wear? The above pictures clothes show how the Yuchi were greatly influenced by the Europeans and the availability of trade cloth. Prior to this time the Yuchi men were breechcloths made from deer skin or bark fabric. The early Yuchi women wore a knee-length skirt, also made from deerskin or a bark fabric. Both early Yuchi men and women painted their faces for special occasions and also decorated their bodies with piercing and elaborate tattoos. For special rituals and ceremonies the ancient Caddo wore beautiful feather cloaks and feather headdresses. What weapons did the Yuchi use? The weapons used by the Yuchi tribe included axes, war clubs, maces, knives, pikes and bows and arrows. What did the Yuchi tribe live in? The Yuchi tribe lived in highly organised villages consisting of grass huts. Each village had a temple, which in ancient times, was located on top of an 8 feet high mound (see Natchez Tribe for more facts about grass houses). The grass houses were built by using a framework of beams and poles that were covered with wattle and daub. The interior and exterior walls were covered by cane mats and the roof was made of tightly clipped thatched grass. What did the Yuchi tribe eat? The people of the Yuchi tribe ate included their crops of corn (maize), beans, squash, seeds and pumpkin. They also hunted for meat from bear, fox, deer, turkey, rabbit, rodents and other smaller game. The y also gathered wild plant foods. Food was cooked into cornbread, soups and hominy. The people also grew tobacco and a grain-bearing grass. Yuchi History: What happened to the Yuchi tribe? The following Yuchi history timeline details facts, dates and famous landmarks of the people. The Yuchi timeline explains what happened to the people of their tribe. 1600's: Violent conflicts with the Cherokee and Shawnee tribes force the Yuchi to move to Georgia and Alabama. Some move even further south to Florida. 1817: First Seminole War (1817–1818) erupted in Florida as the Seminole Indian tribe, together with some Yuchi allies, defended their lands and runaway slaves. 1893: The Dawes Rolls, or the Final Rolls of the Five Civilized Tribes, entitled an allotment of land to tribe members, in return for abolishing their governments and recognizing Federal laws. The Dawes Commission politically devastated the Euchee (Yuchi) people as it legally classified them as Creeks for the purposes of land allotment.